As You may have known before now, a door is a screen used to seal an accessible opening in a building and between rooms within a building. Having said that, i will like to make it known that a door is an important aspect of a building. Here is a list of factors you must consider when choosing doors for your building. 1. Aesthetics: This is an important factor you must consider when choosing doors for your property. A Door must be such that will add some beauty to the style of your building. 2. Function: Although a door according to the definition above is a screen that seals an opening in a building, may i also say here that some doors are more important than others. To illustrate, lets compare the door to a strong room in a bank to the door to the cafeteria. Now you get what i mean right? So in choosing your door, you must understand that Front doors and bedroom doors are often required to be tough so as to provide a good level of security for those inside as well as their belongings. 3. Your Pocket: Before you select doors, ensure its such that you can afford. Always cut your cloth according to your size and ensure it stays that way. Having said this, i will suggest you go for something simple that will still be able to serve the same purpose of a door. 4. Your Taste: Your taste is another factor you must consider. Me i cannot have a door i do not like in my house o. Even if i happen to move into a house with weak door, i will be worried till the day its changed. Note: That your taste and pocket works hand in hand here. If you must have a high taste, then be ready to have all the cash required to meet the taste too. 5. Your Personal Security: I will recommend a bulletproof door for every home, but then again i understand that there are those that cannot afford such doors. Just ensure the door you have in your home are able to afford you some good level of security. 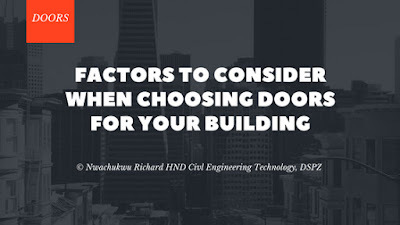 Well, that's about the Factors to consider when choosing doors for your building, i hope you found this very interesting.